FARM SHOW's FREE Newsletters include new articles that have NEVER been published before in the magazine, past favorites from our huge Archives plus our popular Shop Tip & Video of the Week and MORE! SIGN-UP today to start receiving our Newsletter, which also includes Subscriptions Offers and Special Discounts on our popular Books, Encyclopedias and Collections. Pickup Blade Keeps Driveway "Grader Smooth"
Bus Converted To 3-Ton "Pickup"
Half-Sized Bales, Sell Like Hotcakes! 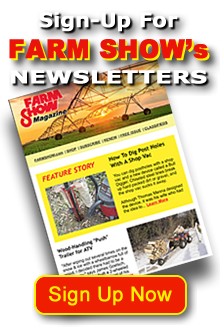 Recieve FARM SHOW's unpublished stories & archived favorites delivered directly to your inbox! CLICK HERE to Sign-Up for FARM SHOW's NEWSLETTERS! Want even more FARM SHOW? CLICK HERE to Subscribe to FARM SHOW Magazine!